このチュートリアルでは、ASP.NET SignalR 2 を使用して、リアルタイムのチャット アプリケーションを作成する方法を示します。This tutorial shows how to use ASP.NET SignalR 2 to create a real-time chat application. SignalR を MVC 5 アプリケーションに追加し、チャットを送信し、メッセージを表示するビューを作成します。You add SignalR to an MVC 5 application and create a chat view to send and display messages. このセクションでは、Visual Studio 2017 と SignalR 2 を使用して、空の ASP.NET MVC 5 アプリケーションを作成し、SignalR ライブラリの追加、チャット アプリケーションを作成する方法を示します。This section shows how to use Visual Studio 2017 and SignalR 2 to create an empty ASP.NET MVC 5 application, add the SignalR library, and create the chat application. 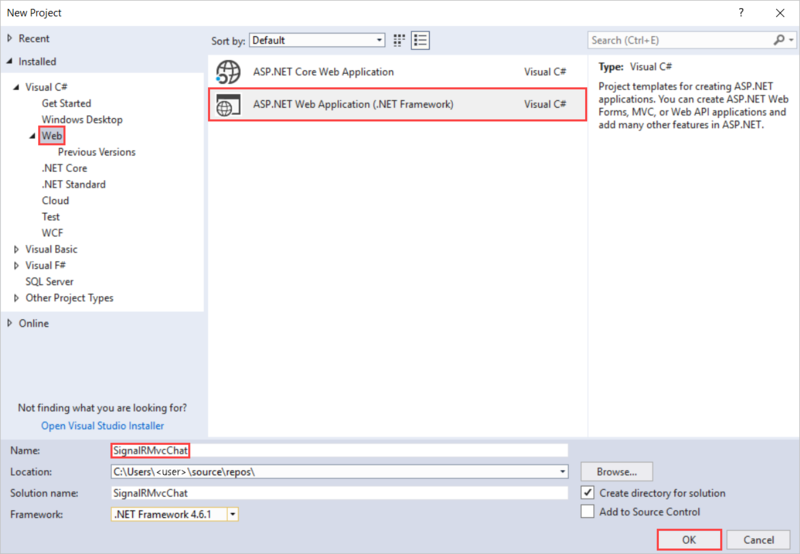 Visual Studio で、c# ASP.NET アプリケーションを作成するには、.NET Framework 4.5 を対象として、SignalRChat、という名前を付けます [ok] をクリックします。In Visual Studio, create a C# ASP.NET application that targets .NET Framework 4.5, name it SignalRChat, and click OK.
新しい ASP.NET Web アプリケーション - SignalRMvcChatを選択しますMVC選び認証の変更します。In New ASP.NET Web Application - SignalRMvcChat, select MVC and then select Change Authentication. 認証の変更を選択します認証なし をクリックOKします。In Change Authentication, select No Authentication and click OK.
新しい ASP.NET Web アプリケーション - SignalRMvcChat、 OK。In New ASP.NET Web Application - SignalRMvcChat, select OK.
ソリューション エクスプ ローラープロジェクトを右クリックし、選択、追加 > クラスします。In Solution Explorer, right-click the project and select Add > Class. 新しいクラスの名前スタートアップし、プロジェクトに追加します。Name the new class Startup and add it to the project. ソリューション エクスプ ローラー、コント ローラー > HomeController.csします。In Solution Explorer, select Controllers > HomeController.cs. このメソッドを追加、 HomeController.csします。Add this method to the HomeController.cs. このメソッドが戻る、チャット後の手順で作成するビュー。This method returns the Chat view that you create in a later step. ソリューション エクスプ ローラー、右クリックビュー > ホーム、選び追加 > ビューします。In Solution Explorer, right-click Views > Home, and select Add > View. ビューの追加、新しいビューを指定してチャット選択追加します。In Add View, name the new view Chat and select Add. 一致しない場合は、更新、 .cshtmlファイル。If they don't match, update the .cshtml file. ここで、追加、コメントを送信します。Now, add a comment and select Send. 他のブラウザーでは繰り返しません。Repeat that in the other browsers. コメントは、リアルタイムで表示されます。The comments appear in real time. 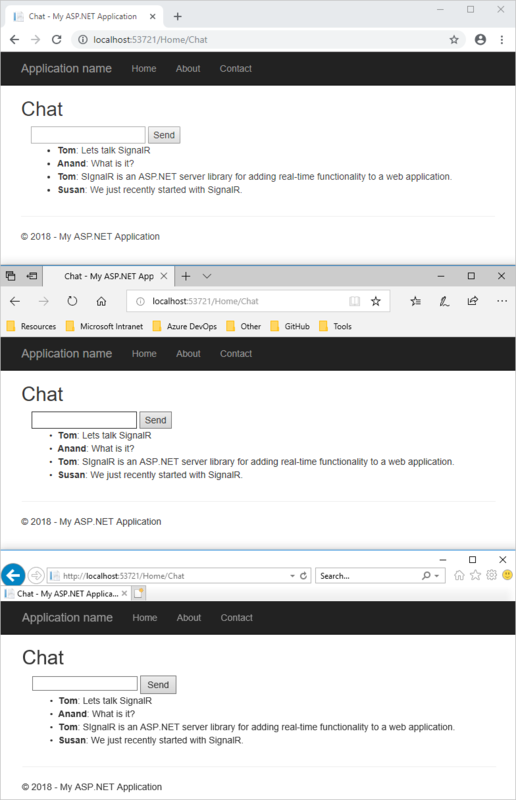 SignalR のチャット アプリケーションでは、2 つの基本的な SignalR 開発タスクを示しています。The SignalR chat application demonstrates two basic SignalR development tasks. ハブを作成する方法を示します。It shows you how to create a hub. サーバーは、メインの調整オブジェクトとしてそのハブを使用します。The server uses that hub as the main coordination object. 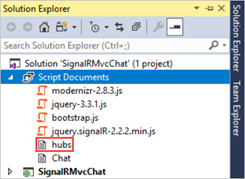 ハブは、メッセージを送受信する SignalR jQuery ライブラリを使用します。The hub uses the SignalR jQuery library to send and receive messages. コード サンプルで、ChatHubクラスから派生、Microsoft.AspNet.SignalR.Hubクラス。In the code sample, the ChatHub class derives from the Microsoft.AspNet.SignalR.Hub class. 派生する、Hubクラスは、SignalR アプリケーションを構築する便利な方法です。Deriving from the Hub class is a useful way to build a SignalR application. ハブ クラスにパブリック メソッドを作成し、web ページ内のスクリプトから呼び出すことによってこれらのメソッドにアクセスできます。You can create public methods on your hub class and then access those methods by calling them from scripts in a web page. クライアントが呼び出すチャットのコードで、ChatHub.Send新しいメッセージを送信する方法。In the chat code, clients call the ChatHub.Send method to send a new message. ハブに送信メッセージのすべてのクライアントを呼び出してClients.All.addNewMessageToPageします。The hub in turn sends the message to all clients by calling Clients.All.addNewMessageToPage. クライアントで関数を呼び出す (など、addNewMessageToPage関数) クライアントを更新します。Call a function on the client (like the addNewMessageToPage function) to update clients. Chat.cshtmlビュー ファイルのコード サンプルでは、SignalR jQuery ライブラリを使用して、SignalR hub と通信する方法を示しています。The Chat.cshtml view file in the code sample shows how to use the SignalR jQuery library to communicate with a SignalR hub. コードは、多くの重要なタスクを実行します。The code carries out many important tasks. ハブの自動生成されたプロキシへの参照を作成しをクライアントにコンテンツをプッシュするサーバーを呼び出すことができ、ハブにメッセージを送信への接続を開始する関数を宣言します。It creates a reference to the autogenerated proxy for the hub, declares a function that the server can call to push content to clients, and it starts a connection to send messages to the hub. サーバー上のハブ クラスは、各クライアントにコンテンツの更新をプッシュするには、この関数を呼び出します。The hub class on the server calls this function to push content updates to each client. 省略可能な呼び出し、htmlEncode関数を HTML に方法が表示されますが、ページに表示する前に、メッセージの内容をエンコードします。The optional call to the htmlEncode function shows a way to HTML encode the message content before displaying it in the page. スクリプト インジェクションを防止する方法になります。It's a way to prevent script injection. このアプローチによりイベント ハンドラーが実行される前に、接続を確立するようになります。This approach ensures that you establish a connection before the event handler executes. コードが接続を開始しのクリック イベントを処理する関数に渡します、送信チャット ページ ボタン。The code starts the connection and then passes it a function to handle the click event on the Send button in the Chat page. ASP.NET SignalR 2 を使用して、頻度の高いメッセージング機能を提供する web アプリケーションを作成する方法については、次の記事に進んでください。Advance to the next article to learn how to create a web application that uses ASP.NET SignalR 2 to provide high-frequency messaging functionality.